Today I am continuing on with Part 2 in my series on pie crusts basics. Last week’s tutorial, titled Pie Crust Basics – Part 1: The Single Crust Pie included my pie crust recipe and techniques for making a single crust pie. Today I’ll be showing you how to put together a double crust pie. 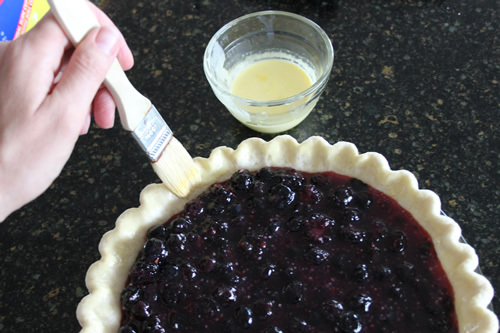 Once the bottom crust comes out of the oven you want to let it cool completely while making the pie filling. This keeps the crust nice and flaky once the filling is added. When ready, take the second disk of crust out of the refrigerator and roll it out the same way you did for the bottom crust. It doesn’t need to be quite as large of a circle as the bottom crust was, but should fully cover the top. I take a ruler and measure the distance across the outer edges to make sure I roll my circle out large enough. Then take a knife or pizza cutter and trim off the jagged edges. This just makes it a little easier to work with. Ideally the top crust should be slightly thinner than the bottom crust but, to be honest, I never pay much attention to that. I tend to roll my crusts out a little thicker than what some would call “ideal” but I just like them that way. The filling needs to be able to release steam while it cooks so you have to add some slits or cutouts in your top crust. 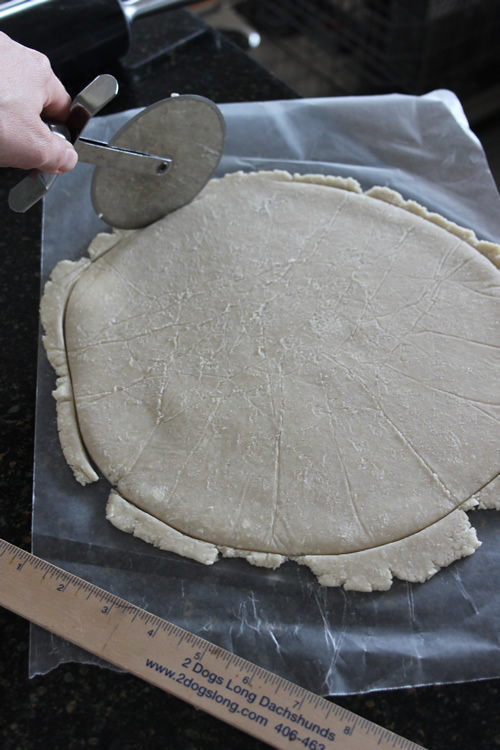 You can add the crust and then use a knife to cut small slits out of the crust or, if you are like me and like to do cutouts, then it is easiest to do them before you put the crust in place. 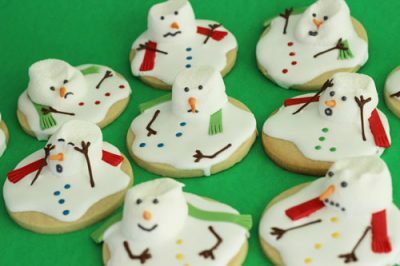 Small cookie cutters are great for making decorative cutouts. 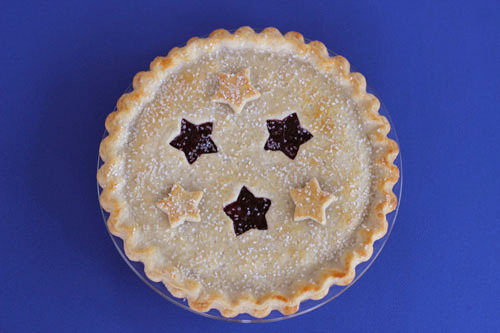 For this particular pie I used a small star cutter . 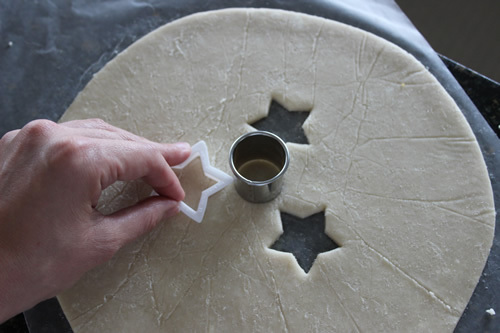 To make sure the cutouts were evenly spaced around the middle of the crust, I took a round cutter and laid it lightly in the center of the dough then placed the tip of the star cutter next to it and cut out the first star. I continued around the circle, cutting out the other two stars and saving the cutouts to attach later. With the top crust ready, you can fill the bottom crust then brush some beaten egg glaze around the edges to act as your glue. Egg glaze is made by mixing an egg yolk with 1-2 Tablespoons of heavy cream. Lay the top crust on top of the pie, lifting it on to the pie while attached to the waxed paper then carefully removing the waxed paper (like I explained in last week’s tutorial). 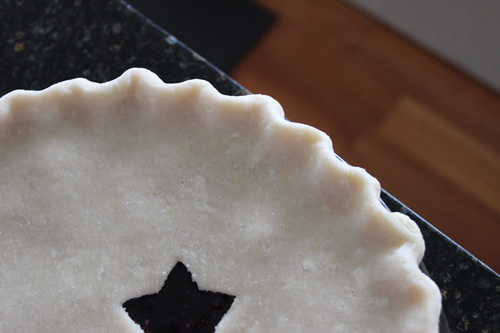 While it is still stuck to the waxed paper you can move it if needed to center it in the middle of the pie. After removing the waxed paper, use your thumbs to gently press it against the edge of the bottom crust. 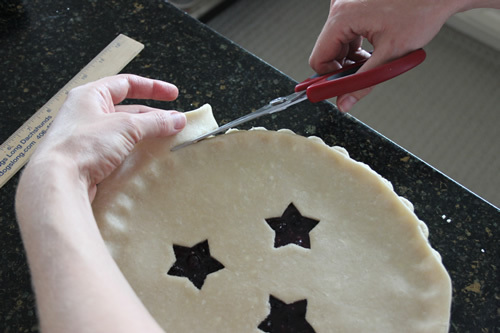 With kitchen shears, trim the top crust even with the bottom crust. Then use your fingers to smooth and seal the crusts together. 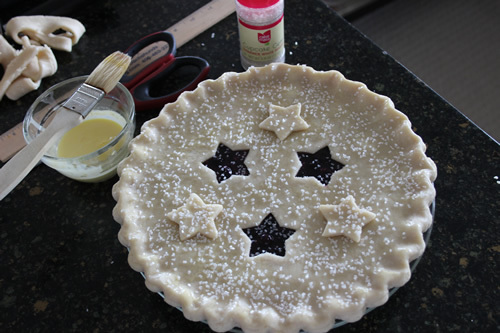 Finish up the top by brushing egg glaze all over it then attaching the star cutouts and, if desired, sprinkle withsanding sugar or granulated sugar. You don’t want to brush your glaze on too heavily to where it puddles up on your crust but I accidetnally went a little too light with it on this pie so it didn’t turn out quite as golden as I would normally like. On a side note, this is the first time I have used the Cake Mate brand of sanding sugar and I didn’t really like the size and coarseness of the sugar granules as much as I like other brands I’ve used before. I felt they were much too large. Next time I will go back to using my favorite, the CK Products brand, which has a finer granule. Now it is ready to go in the oven and bake according to your recipe directions. Keep an eye on it because in the last 10 or 15 minutes of baking time you may need to add some foil around the edges to prevent them from burning. 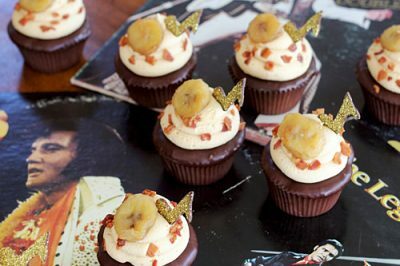 To do this, tape strips of foil together then fold up their edges so that they are all about the same width. 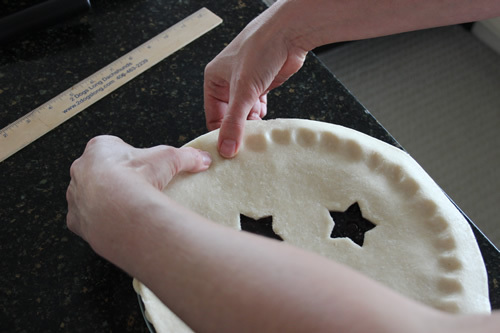 Wrap the strip around the pie (be careful because the pie will be hot) and tape the ends together. Make sure you remove the pie from the oven while you do this so that you don’t burn your hands or let the oven heat escape. 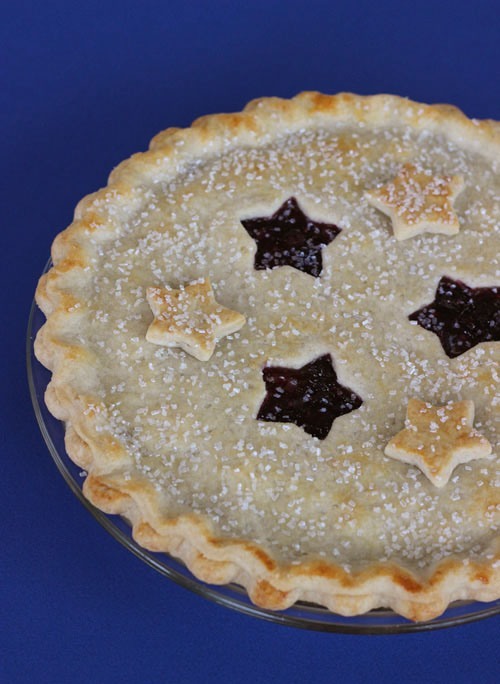 I forgot to take a picture of this on my star pie so I am using a picture from my Southern Comfort Pie tutorial as an example. Sometimes I will cover the edges before the pie goes in the oven and let it bake for 10-15 minutes then remove the foil and finish up the baking time without it. 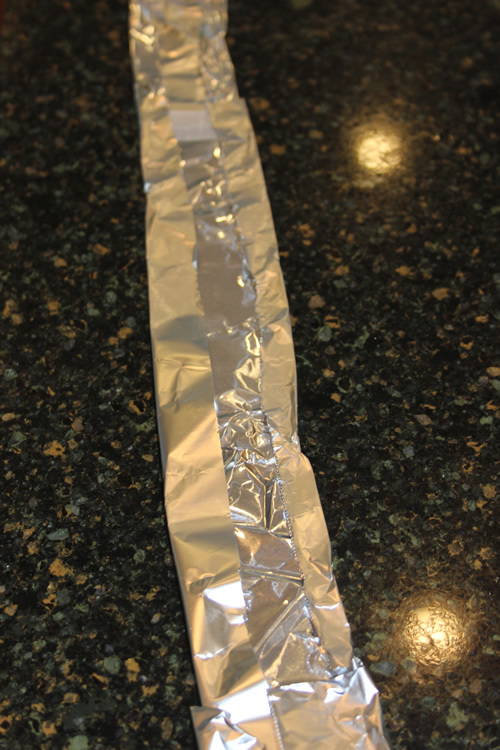 This makes it easier to attach the foil since the pie isn’t hot but it is also hard to guess how long the foil needs to be on and you may not get your edges browned enough if it is left on too long. You can also use a pie shield to take the place of the foil but I have used them in the past and have never liked them very much. They don’t always fit exactly how I want them too. I like that you can bend and adjust the foil as you need it to cover thicker or thinner areas on the pie. 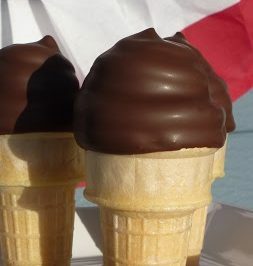 If your cutouts are starting to get too brown you can also take a few small pieces of foil and lay them on top of the cutouts. 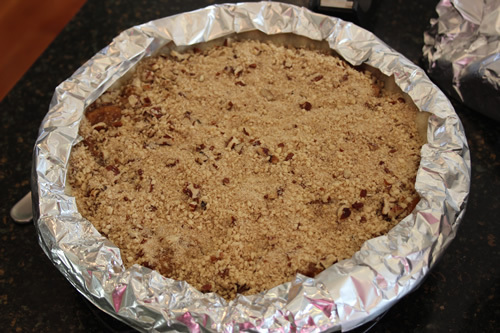 Allow your pie to cool once it is out of the oven so that the filling can set up. Then enjoy! I’m going to leave you with a trouble shooting guide. I found this in a little pie cookbook that I picked up at an antique store a few years back. Here are some possible reasons for some of the most common pie crust dilemmas. I hope these help you with any problems you may be having. Next time I will finish up this pie crust series with a tutorial on making a lattice top pie. Great tips. Your pies look perfect!